Pressure Tech - Quality Pressure Regulator Manufacturers - FROM 200G TO 200KG! No job too small, and no job too big! 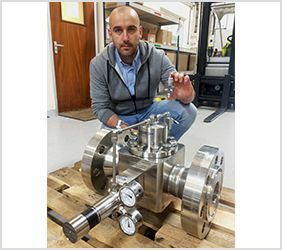 In the past 12 months, Pressure Tech have developed a 200 gram pressure regulator for use on H2 fuel cell UAV drones and a 200 kilogram flanged back pressure regulator for a desalination plant in the USA, which exemplifies our ability to work closely with our customers and provide exact products to meet their needs. None of this would be possible without our excellent team of people with their creative ideas and solutions to resolve a whole range of applications thrown at them on a weekly basis.